The Site24x7 iOS app is a free supplement to the Site24x7 monitoring service. To use the app, you need a Site24x7 account or you can signup for a risk-free 30-day trial from the app. The Site24x7 App is made for website and server monitoring on-the-go. The app provides real-time alerts on your iOS device when a performance problem occur on your technology stack. With the Site24x7 app you can monitor availability and performance of websites, servers, web applications, cloud, VMs and network even while on the move. * Get instant alerts directly to your iOS device via push notifications. Start or stop services of a server monitor, EC2 and RDS instances. * Graphical view for monitor’s response time. * Find out which monitors are currently down and which ones are in trouble from the Alarms tab. Pick/unpick alarms right from the app. Admins can also assign alarms to technicians. * Monitors are classified into web and server monitors for easy access. * Quickly add web monitors right from the app. * A dashboard for the MSP user that provides a quick glance at the monitor availability status of all customers. 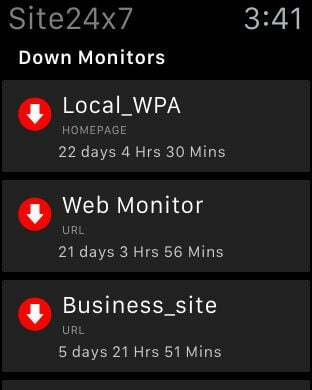 * The handy monitor status widget lets you check which monitors are up, down, in trouble or under maintenance. * The app also comes with an Alarms widget which displays which monitors are down and in trouble. You can also pick/unpick alarms directly from the widget. * Add Monitors and perform admin actions from Admin tab. Site24x7 is an All-in-One monitoring solution that offers full-stack infrastructure monitoring and end-user experience monitoring from the cloud. A policy-driven, AI enabled alerting and a comprehensive reporting engine complement the overall monitoring capabilities of Site24x7. Site24x7 was born when the collective IT expertise of ManageEngine, a world-class IT management software suite and ZOHO, a SaaS leader for business and productivity applications came together to build a monitoring solution for IT and DevOps. Monitor routers, switches, load balancers, firewalls, and critical devices in your data center or your customers' efficiently and cost effectively.